Since 1968, the New River Train has been taking travelers on an annual fall excursion through the scenic New River Gorge in West Virginia. The 300-mile round-trip journey takes a special excursion from Huntington to Hinton and back with a 65-mile-long stretch through the New River Gorge and two sightseeing stops. The New River Train Excursion is much more than just a fall foliage train ride. Much of this stretch of the New River Gorge is inaccessible by car, making the trip a unique opportunity to view the beautiful New River Gorge up close. You'll pass ghost towns, old coal mining sites, and numerous scenic spots tucked deep into the Gorge. Guides onboard each car point out the various ghost towns and remains of old coal mining sites still visible along the route of the railroad through the Gorge. This is a long day, so be sure you wear comfortable clothes and good walking shoes and get a good night's sleep before you go. The day-long, 300-mile New River Train excursion also offers a chance to tour the historic Thurmond Depot, plus a three-hour layover in Hinton, where Railroad Day festivities include food, arts and crafts, and entertainment. 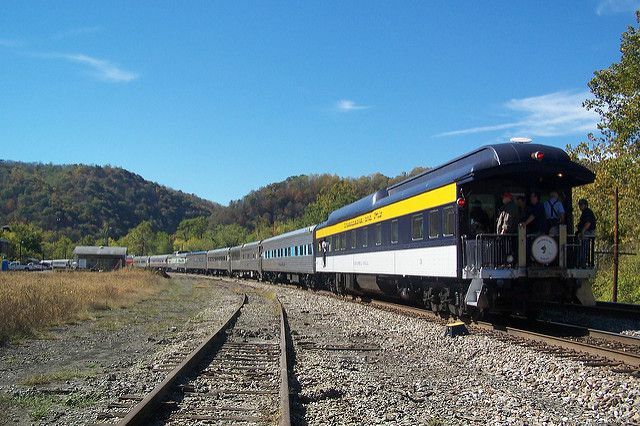 Each of the trips departs from Huntington C&O Depot and will stop first at St. Albans to pick up other coach passengers before continuing through Teays Valley area and the Kanawha River up to the mouth of New River at Gauley Bridge. The train then follows the New River for the remainder of the journey to Hinton. You'll pass downtown Charleston and the State Capitol building, the Institute of Technology, Kanawha Falls, the Hawks Nest Dam and bridge, the Stretcher Neck Tunnel, Sandstone Falls, and the famous New River Gorge Bridge in Fayetteville. Additionally, you can expect to see a number of historical artifacts and towns from the region's coal mining era. The New River Train is operated by the non-profit Collis P. Huntington Railroad Historical Society to help fund restoration of railroad equipment, maintain its museum, and associated railroad historical projects. Tickets typically cost between $179 per person for the "Heritage" (standard) package and $600 for the luxury Business Class package. The dates for the New River Train fall foliage excursions are in October and may vary from year to year. Each of the four trips departs from Huntington in the morning and also picks up passengers with reservations at St. Albans and Montgomery. The New River Train uses Amtrak (diesel) locomotives and a mixture of Amtrak and privately owned, Amtrak approved horizon coaches, heritage coaches, lounges, parlor cars, dome lounge, sleeper lounges, and an open platform private car. You can either ride with other passengers in the regular class cars or even rent out your own private car for your family, friends, or business.